Can someone get some pallbearers? I think Microsoft will need a hand carrying the Xbox One's coffin to the grave. I would say get some Xbox fanboys to help bury the new console, but they're too busy standing in line to reserve their pre-orders for the PlayStation 4. Why the early death celebration of the One? Well, Sony has confirmed that free-to-play games on the PS4 are genuinely free-to-play and won't require PlayStation Plus. This means that if you want to play PS4 launch titles like Warframe, DC Universe Online or PlanetSide 2 without paying a cent, you can do so even if you don't have any cash left after paying for the PS4 itself. Think about that: You can game on the PS4 without spending a dime outside of paying for the system itself. The console will allow players to game online with free-to-play titles at the publisher's discretion. "As far as free-to-play games are concerned, it's the publisher's decision whether they put it inside or outside of PS Plus." Too bad Microsoft couldn't clear up any of the issues regarding free-to-play and Xbox Live given that they canceled all their E3 roundtable discussions. Anyway, the price of PS Plus is also staying the same as it is for the PS3, at $50 a year, which rounds out to just over $4 a month. As mentioned before, you won't have to register for PS Plus to make use of streaming apps such as Hulu or Netflix, in addition to the PS4 being region free. 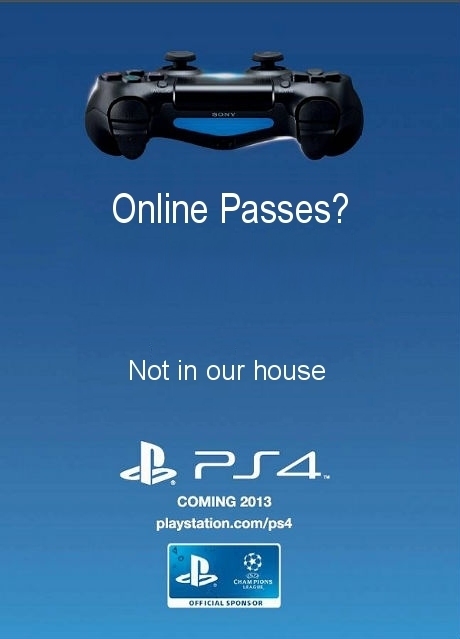 Adding insult to injury, Sony has also made it known that the PlayStation 4 will not have Online Passes and third-party publishers have been barred from using Online Passes. This isn't even a fight anymore, it's more like Sony showering people with gifts while walking away from an Xbox One explosion that Microsoft duct taped themselves to. It's embarrassing. Compare this to the Xbox One and it's region restrictions, compare this to the Xbox One preventing indies from self-publishing and compare this to the Xbox One forcing you pay for Xbox Live Gold to play free-to-play games and even leaving DRM out of the equation the PS4 just kind of runs circles around the competition...assuming we can even call it competition at this point. So uh, how does PS4 vs Wii U sound?